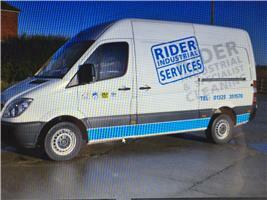 Rider Industrial - Asbestos Services, Drain/Sewer Clearance, Rubbish/Waste/Clearance based in Stapleton, County Durham. Hello, I am Paul Rider of Rider Industrial, we are a small North East based company who specialises in drain services such as high pressure jetting, CCTV inspections and repairs. We also carry out asbestos removal & disposal whether it's a few tiles from you floor, the redundant flue in your loft or the dismantling of that eyesore garage with the asbestos roof. I started this company in 1999 and have over 18 year experience working with councils, housing associations and endless private customers and most of all I have excellent well trained staff who work along side me. So please don't hesitate to contact us with your enquiry for a fast & professional service.